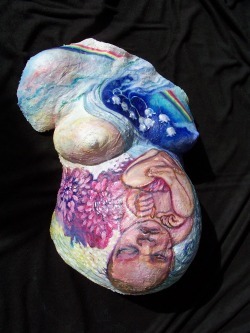 The intrigue involved with creating these belly casts comes from the connection of the mother and her unborn infant. 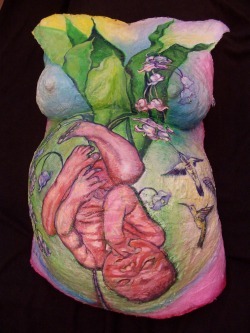 Each woman is uniquely shaped, first in accordance to her own physiologically and second, in relation to the position of the baby in her womb. It is important that I place the baby’s portrait in the correct pose within the mother’s belly so that the three dimensional form of the mother and the two dimensional painting of the baby fit together perfectly. For each design, I consider imagry and symbolism that connects with the family. With Liam’s Fate I used the element of air, the element Liam was born under. His flowers are chrysanthemums and day lilies. Cozette’s Journey includes three hummingbirds. This was a surprise I added for the baby’s mother because I wanted to include symbols of all three of her children even though she would have a belly cast of only one of the three. Added later is a vertical line beneath the infant’s shoulder. At first this may appear to be the stalk belonging to the greens of the foliage that reach up to the mother’s clavicle bone. Cozette’s birth was traumatic when her mother’s uterus dangerously split opened. It was important to the mother to mark this experience in her belly-cast in a subtle way. With these casts, I allow the casting material to remain raw and evident so that the “wrapped” texture is obvious. I expect the symbolism for this needs no explanation. What is difficult to show in reproduction is the shimmer effect on the surface of these belly-casts. After final glazing the painting is dusted with a fine clear crushed glass powder to reflect light in a jewel-like way.